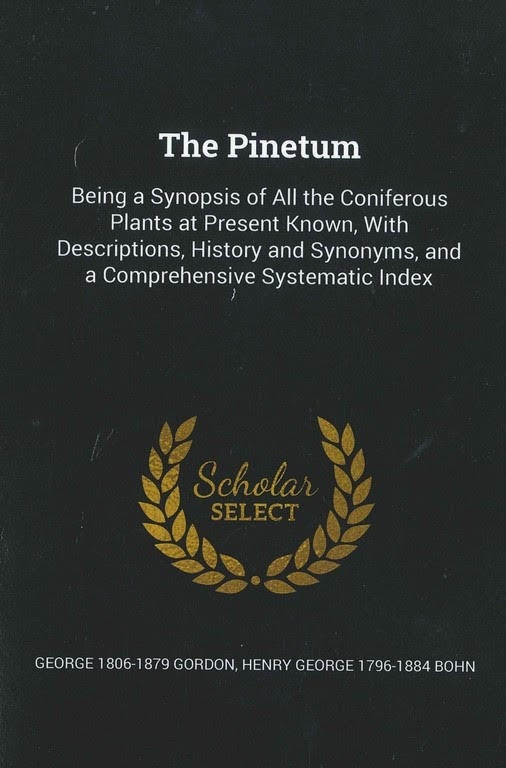 I have belaboured Englishman George Gordon's The Pinetum (1858) in a past blog, so I realize that I risk losing readership if I drag his work into attention again. 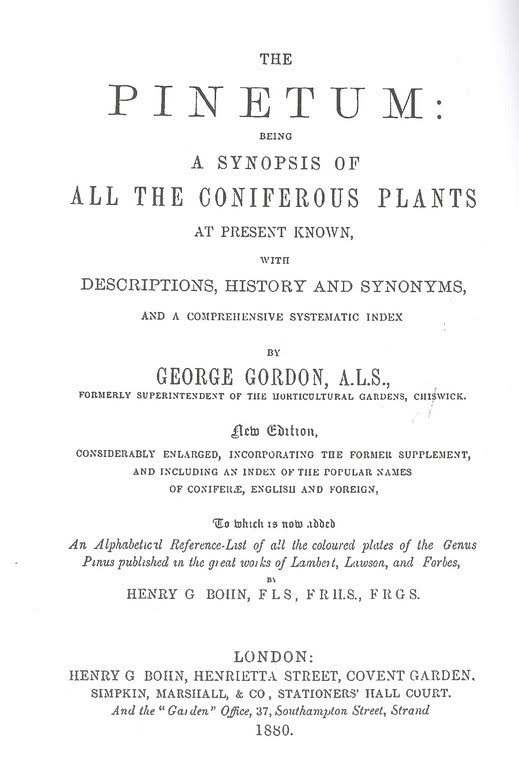 But in that blog I mentioned that Gordon “revised and fully updated” the 1858 publication in an 1879 update, and that I would acquire the newer version to see how it had changed or improved. 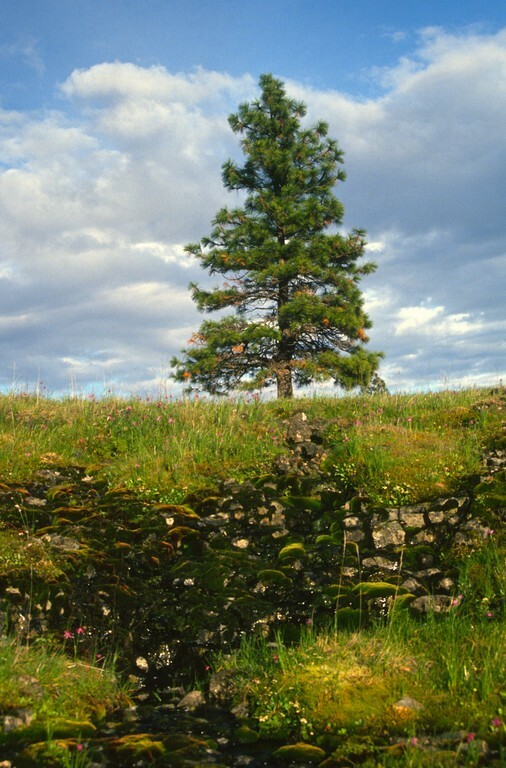 I did, but alas many of the old mystakes remain, such as Abies bracteata, for the second time, being reported as “first discovered by Douglas, on the mountains along the Columbia River...,” and the continued use of Wellingtonia for what is now internationally accepted as Sequoiadendron, and that Abies Pattonii Jeffrey continues to be found on the “Mount Baker Range in Northern California” when no such location exists since Mt. 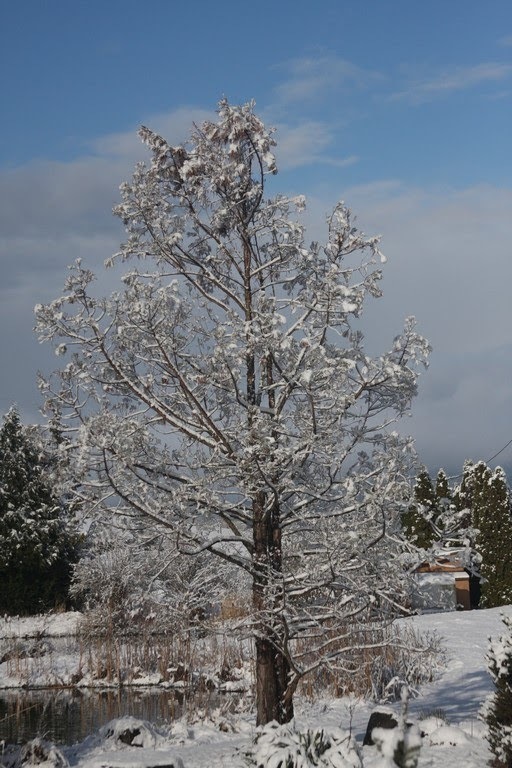 Baker is located in northern Washington...and so on and so forth. The back cover of the weird book states, “This work has been selected by scholars as being culturally important, and is part of the knowledge base of civilization as we know it...” Wow! 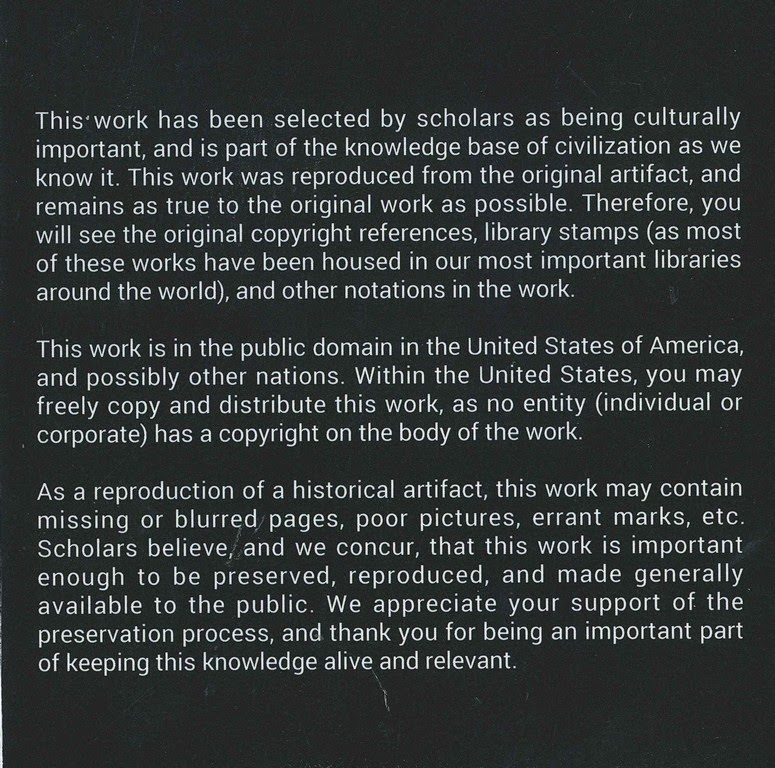 Furthermore, I am informed that: “This work is in the public domain” and that I can copy from it to my heart's content. 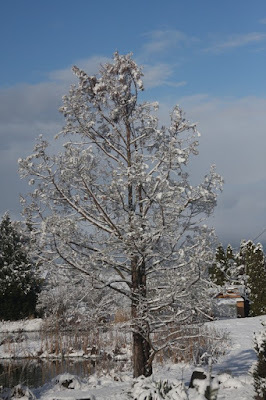 So, finally I am free from the guilt of plagiarism, which has been the Flora Wonder Blog's modus operandi since the beginning. One aspect of the newer edition's “Enlargement” was to add an Index of Popular Names, meaning “common” names. There I learned that Theloo (Spirituous Liquor) is the common name for Juniperus Squamata [sic], the “Scaly-leaved Nepaul Juniper,” and Schmucktanne is the German name for Araucaria. Hak is the “Tree of Life or Evergreen,” a term applied to all the Arborvitae in China, while Haken Kiefer is German for the Mugho pine. Yellow Deal is the common name for Pinus Sylvestris, the “Scotch Fir,” while White Deal is the Norwegian name for Abies excelsa (Picea abies), the common “Norway Spruce.” Closer to home, an American-Indian name I guess, is Sas-coo-pas for the “Big Tree or Great Fir” for Abies Douglasii, the Douglas Fir (Pseudotsuga menziesii). 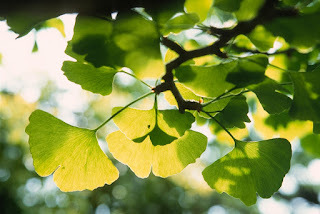 Oh, and one more – which I had never encountered before – is Quachow, deciduous, from China for Salisburia adiantifolia, the “Maiden-hair Tree” (Ginkgo biloba). What great fun these common names! 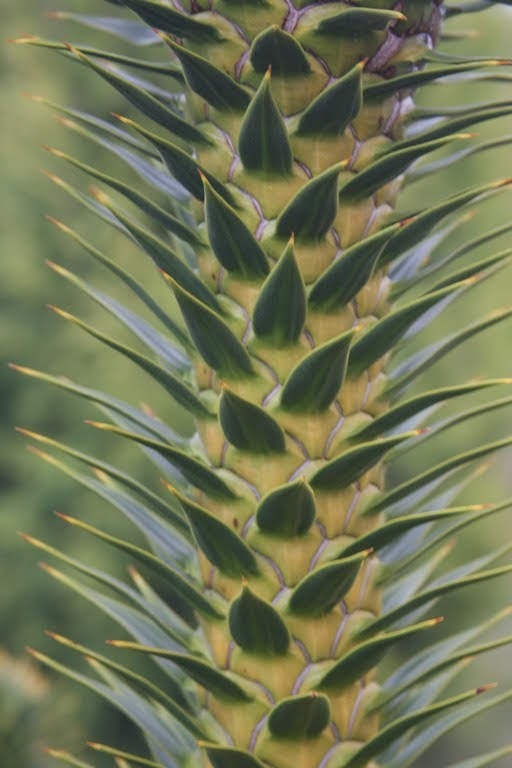 Sorry – I can't stop – how about Quilrblaetterige or Schirm-fichte for Sciadopitys verticillata? Ok, I'll admit, I've already gotten more than my money's worth from my $25.00 coniferous paperback reprint. 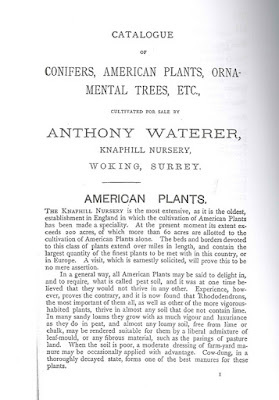 Following the popular name index are five catalogs...er, catalogues from prominent nurseries of the time: 1) Anthony Waterer, Knaphill Nursery, Woking Surrey 2) Richard Smith, Worcester 3) William Barron & Son, Elvaston Nurseries, Borrowash, Near Derby 4) Maurice Young, Milford Nurseries, Near Godalming, Surrey and 5) Lawson Seed and Nursery Company, Edinburgh and London. 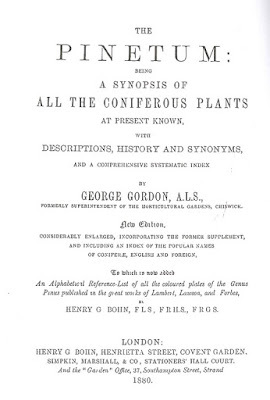 If you were the 6th or 7th prominent nursery in Great Britain and left out of Gordon's book you would bear the author a strong grudge. 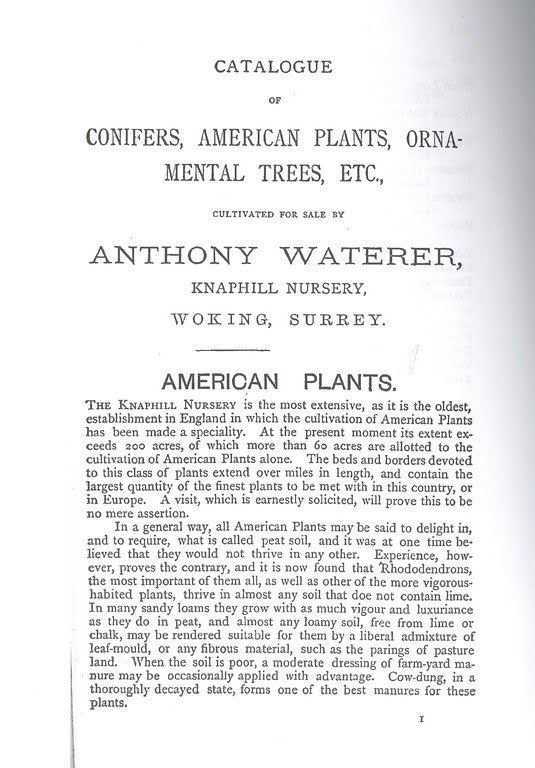 These catalogues are of great interest to me because they detail the plants being grown about 100 years before I entered the nursery industry in 1974. 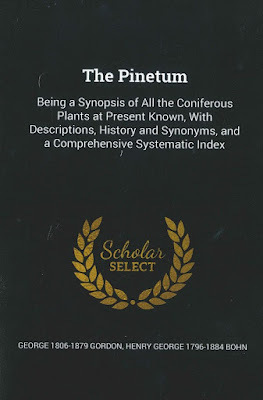 The nomenclature has certainly changed since the yore days, and of course straight seedlings versus today's preponderance of cultivars were usually the plants being offered. 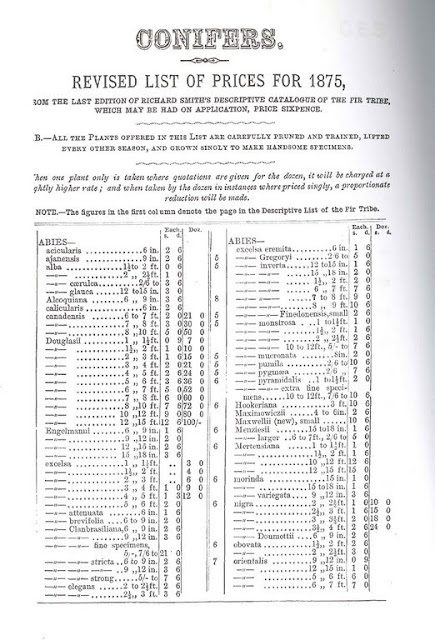 The price to the right of the plant's listing – which was explained to me by a bonafide Englishman – represent shillings (s) and pence (d). 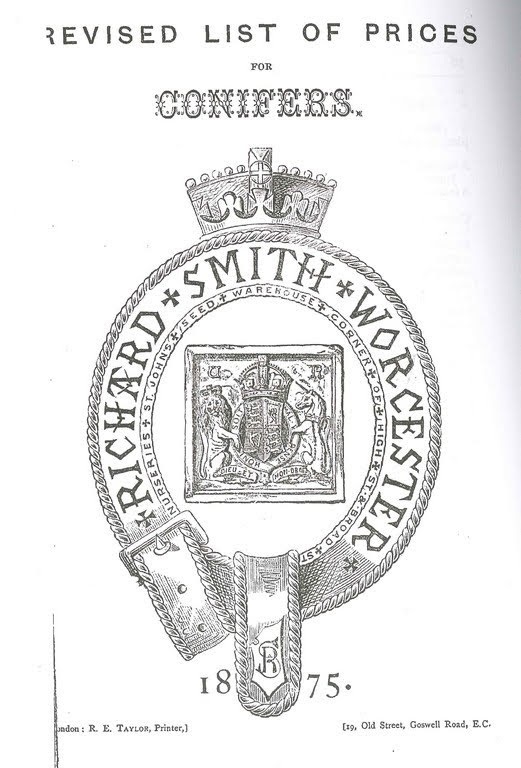 One hundred years ago there were 20 shillings to the pound and 12 pennies to the shilling. England decimalized in 1971, so today the term shilling is no more, but the penny was kept, and there are 100 to the pound. Let's take a look at these nurseries and see what they were growing. 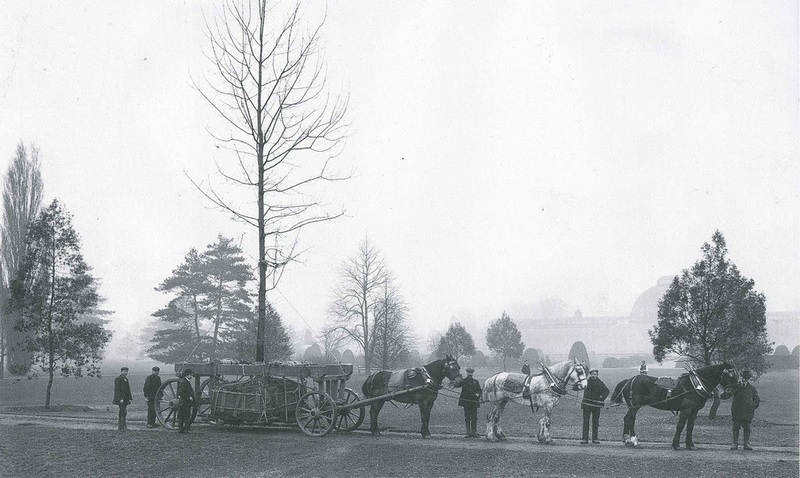 The Woking area was home to nurseries for over 200 years because the soil is well-drained and easily-worked, making it ideal for plant nurseries. 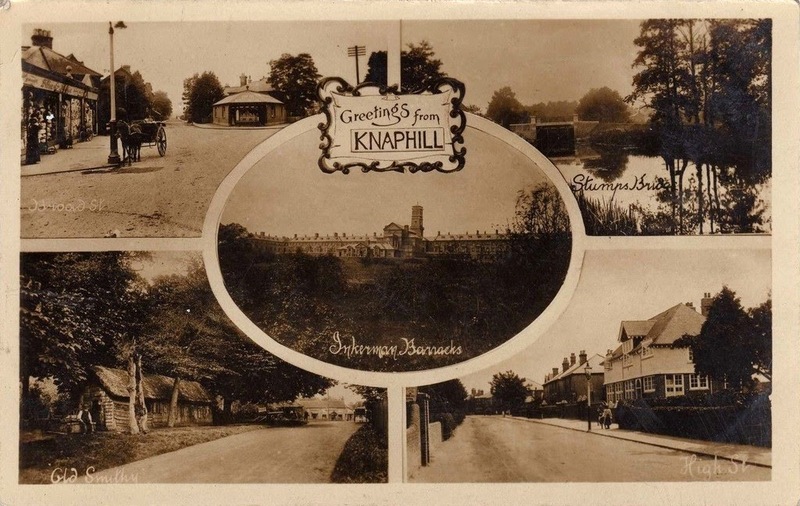 In 1724 Thomas Waterer was farming at Knaphill (AKA Knap Hill), then his grandson Michael Waterer (senior) acquired the bog-land in about 1770, drained it and planted Rhododendrons and other Ericaceous plants. 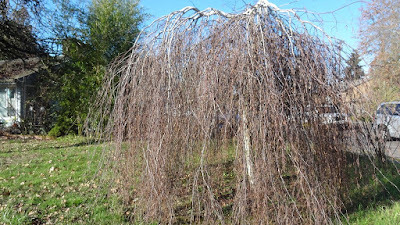 Supposedly a Fagus sylvatica 'Pendula' – the “Weeping Green European beech” – still stands, and it covers a quarter of an acre wide. 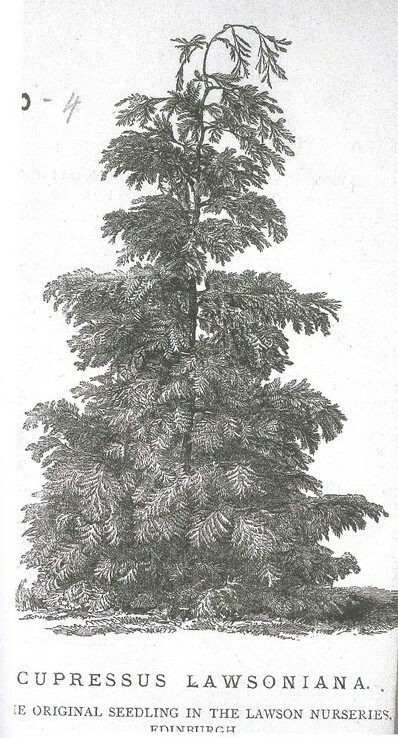 Michael Waterer (junior, 1770-1832) enthusiastically continued the enterprise and especially the hybridization of Rhododendrons, and hundreds of visitors attended exhibits at a show room in Regent Street, London. Michael Jr. made Rhododendron crosses using blood from American species, and when J.C. Loudon, founder of The Gardener's Magazine visited in 1829 he exclaimed that it contained “the largest and finest collection of American plants I ever saw.” In 1853 Anthony Waterer took over, and the nursery was famous for the development of azaleas. 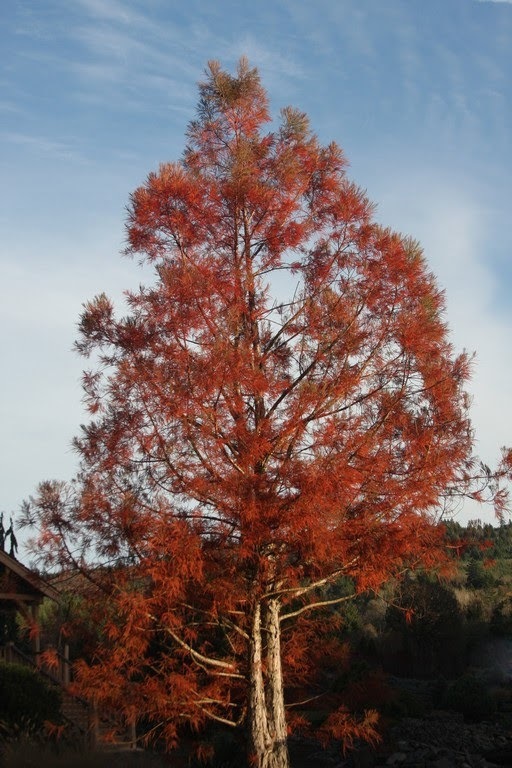 By 1861 there were 107 employees on 350 acres, and stock included Douglas fir over 35 feet high and a Magnolia with a spread of 54 feet. 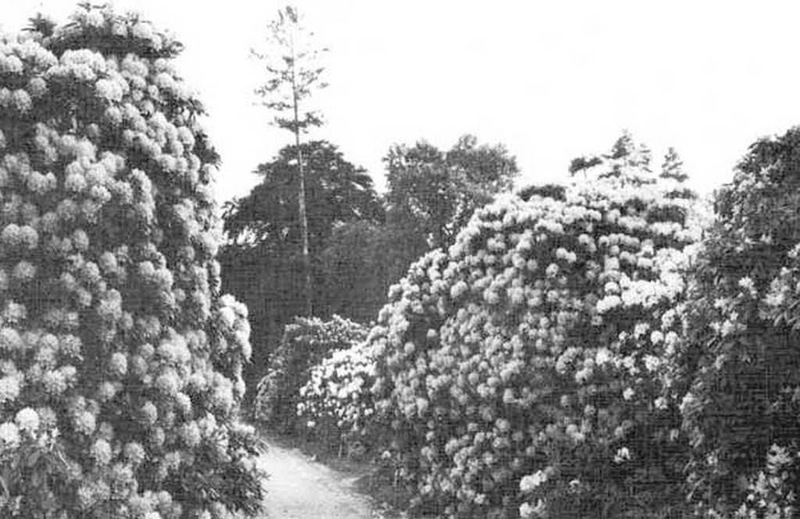 A walk was planted at 2,310 feet in length and 40 feet wide, coined the “Rhododendron mile,” and it drew visits from King Edward VII. 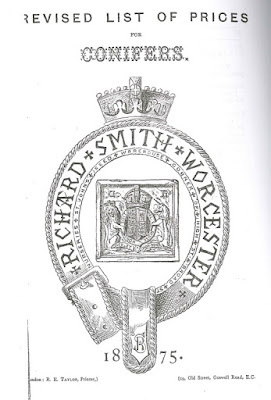 Anthony's son, also Anthony, took over at his father's death, but with the outbreak of WWI much of the staff departed and a memorial recorded the names of those who were killed in action. Anthony lost heart and made no attempt to restore the wilderness the nursery had become. Knaphill offered all kinds of deciduous trees, such as Acer species, Aesculus, Betula, Quercus etc. 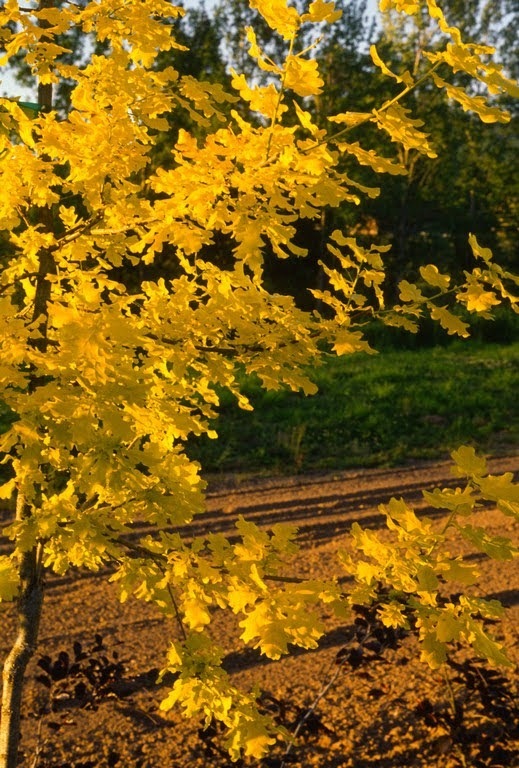 I was surprised to see that Quercus robur 'Concordia' was already in production, and priced from 3s 6d to 7s 6d. 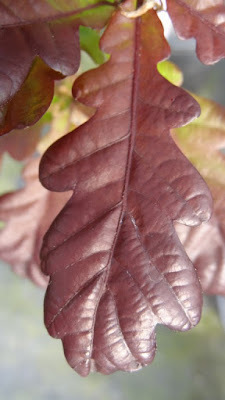 Other cultivars of English oak include 'Heterophylla' (Fern-leaved oak), 'Pendula' (Weeping English oak) and 'Nigra' (Purple oak). Acer colchicum 'Rubrum' is offered, where “In this handsome tree the young leaves are crimson,” but it turns out the specific epithet is synonymous with Acer cappadocicum. Acer palmatum is not listed and instead we have Acer polymorphum, with cultivars 'Atropurpureum', 'Dissectum', 'Palmadifolium', 'Rosea Marginatum' and 'Sanguinea'. The first specimen of Acer palmatum reached England in 1820, but prior to that the Swedish doctor-botanist Carl Peter Thunberg had named it Acer palmatum for the hand-like shape of the leaves. After all, the centuries-old Japanese names kaede (hands of frogs) and momiji (hands of babies) were in use, so I don't know why Waterer used polymorphum (which translates as “many-formed”) in 1875. Richard Smith Nurseries boasted in 1875 of growing 50 acres of fruit trees, 50 acres of conifers and other evergreens and 12 acres of rose trees, with “32 miles of walks for the convenience of attending to the stock, and 2 ½ acres of glass to rear the young plants.” Smith's catalog is exclusively conifers, with Wellingtonia 6-7' tall for 21s. 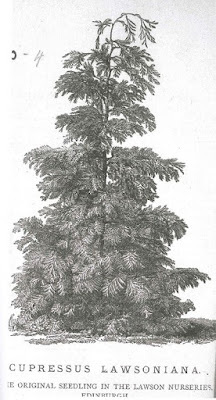 A variegated version of the giant redwood was 15s for a 2 ½' tree. 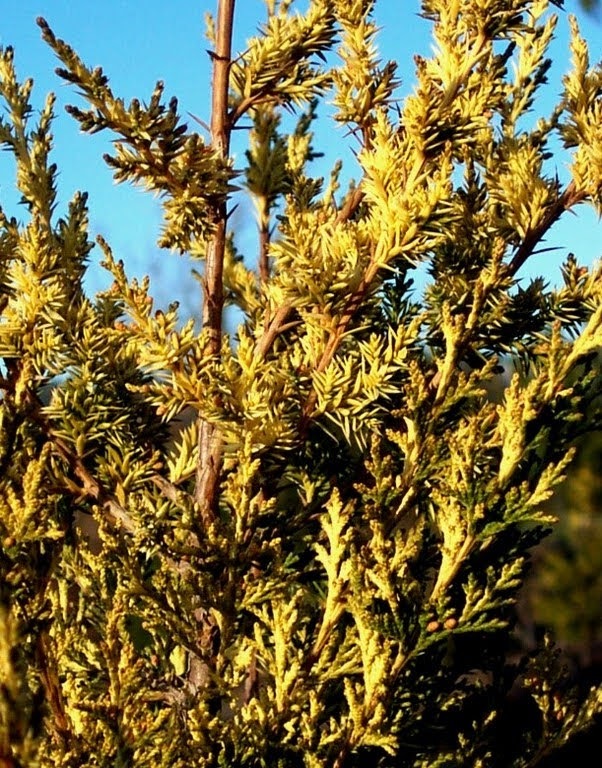 Thujopsis borealis could be had up to 7' tall for 5s, and if you bought one it would today be called Xanthocyparis (Chamaecyparis) nootkatensis, the “Weeping Alaska cedar.” The 'Compacta' and 'Variegata' selections were also available. Chamaecyparis obtusa (hinoki) is not listed in Smith's catalogue, instead we find the old generic name of Retinospora with a number of cultivars. 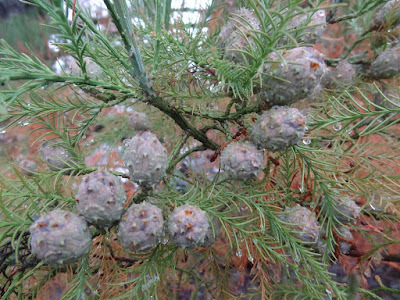 The same is true with Chamaecyparis pisifera, but oddly C. ericoides, filifera, lycopodioides, plumosa, squarrosa and stricta are given specific status. 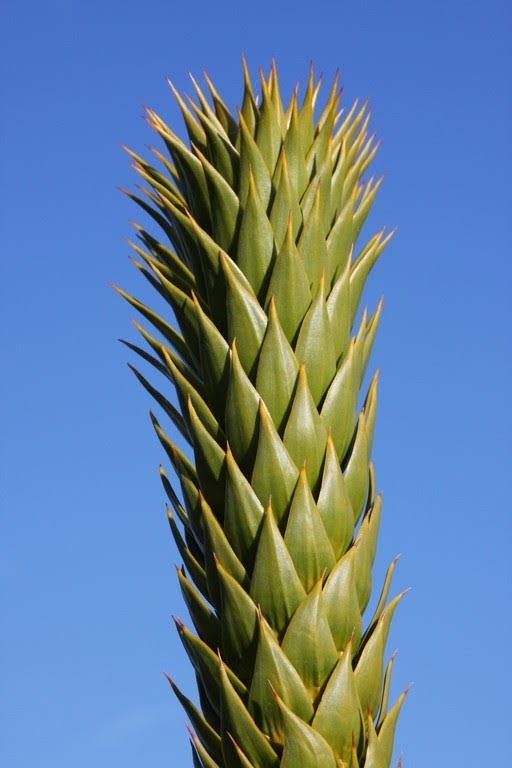 I was surprised to see Smith's listing of Glyptostrobus sinensis pendula since I have never seen a weeping form of what we now call Glyptostrobus pensilis. 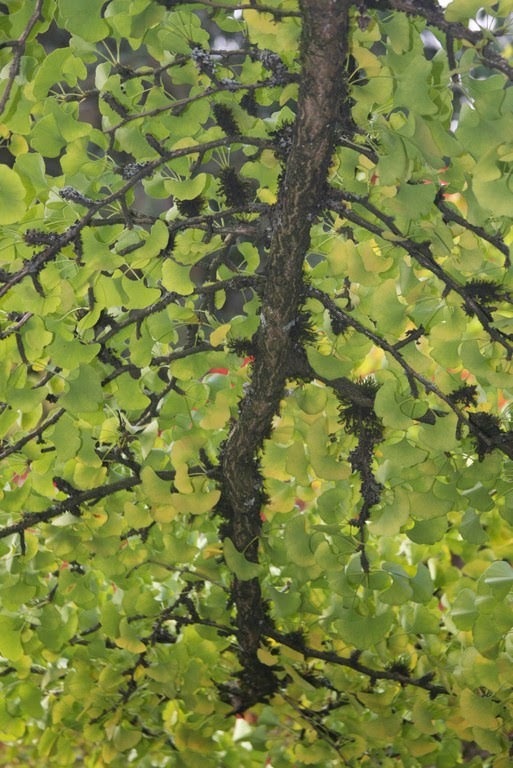 I'm also surprised to read the description of G. pensilis in The Hillier Manual of Trees and Shrubs (2014) that the species is “not recommended for the cold localities...This remarkable species has grown in the SHHG without protection for many years but has achieved a height of only 3m (2013).” C'mon – winters at Hilliers are like those of Club Med compared to mine in Oregon, and I have a 30-year-old Glyptostrobus about 30' tall. 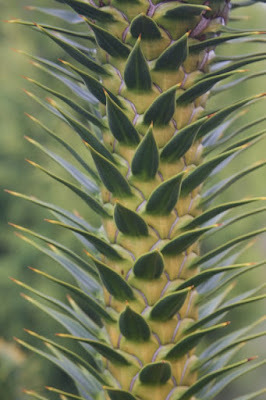 Araucaria imbricata (Chilean pine) now goes with the specific name of araucana, since it was discovered in the 1780's and originally named Pinus araucana. 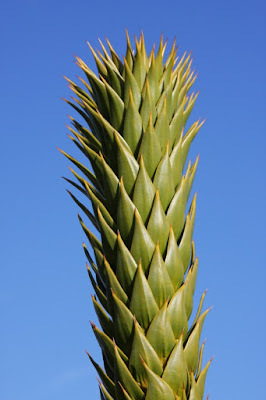 Barron charged up to 110s for a larger-sized “Monkey Puzzle,” but there's no exact height given. 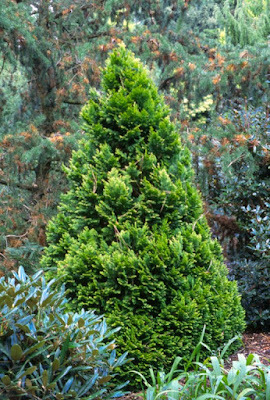 Surprisingly there is an 'Aurea Variegata' listed – I've never seen one – and it is described as “A beautiful golden variety of the Araucaria, raised by Mr. Fowler, Castle Kennedy about 20 years ago, the original plant being now 22 ft. high, and finely variegated all over the tree.” Wow, I was in the area of Castle Kennedy in southwest Scotland 20 years ago – I wonder if the variegated Monkey Puzzle still stands? 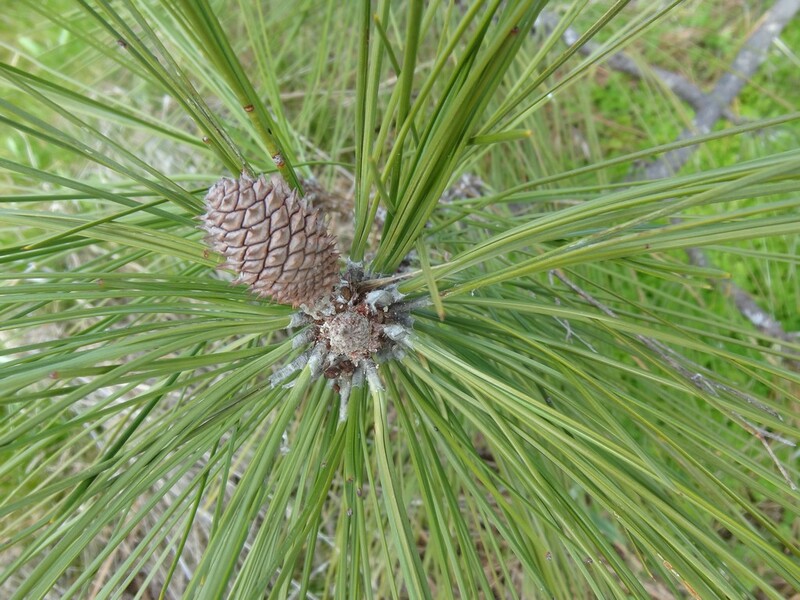 One pine Barron offers is P. Benthamiana, and my guess is that it is a subspecies of Pinus ponderosa, the west group that survives in western Oregon and California. 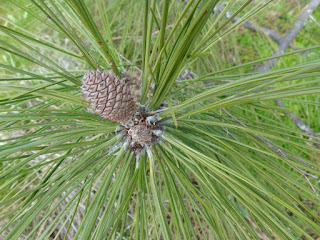 Another species is Don Pedro, and I don't know the botanic name for sure, but I suspect it is P. taeda, the “Loblolly pine.” I'm uncertain about Pinus Mandschuricus, except that “Manchurian pine” is a common name for the “Korean pine,” P. koraiensis, except elsewhere Barron lists a P. koraiensis. 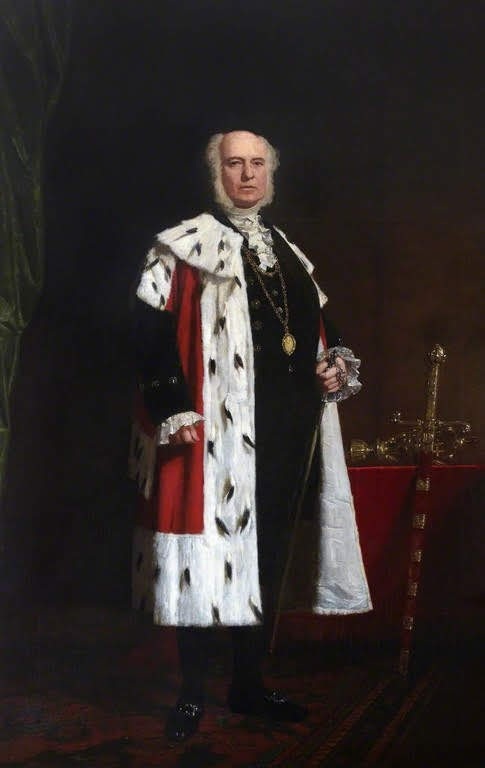 William Barron (1805-1891) was born in Berwickshire, Scotland, and after an apprenticeship at Blackadder he entered the Royal Botanic Garden in Edinburgh where he was put in charge of the glasshouses. 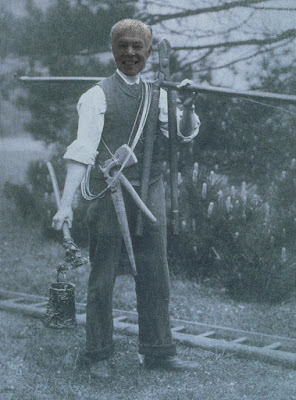 In 1862 he bought 40 acres for a nursery site, then he was joined by his son in 1867. The firm gained a reputation for landscape gardening and the transplantation of large trees and was a leading provider of public park designs. I would love to see his “Transplanting Machine” in action. 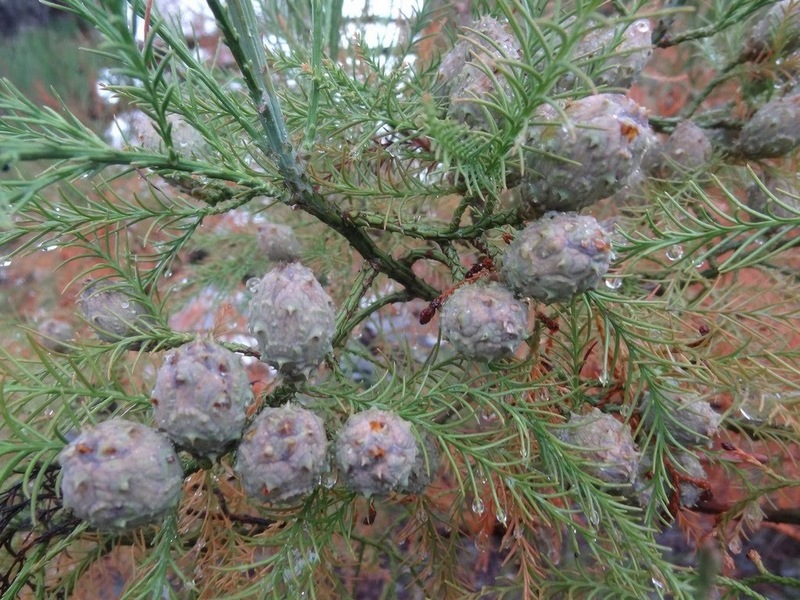 Finally let's consider the Lawson Seed and Nursery Company, for which Chamaecyparis lawsoniana was named. Their catalog is 27 pages long with just a list of plants with prices, with no plant descriptions or additional bragging. Very Scots-like. 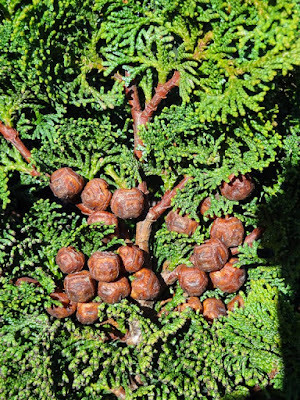 The only ornament is a nice drawing of Cupressus Lawsoniana, supposedly the original seedling. 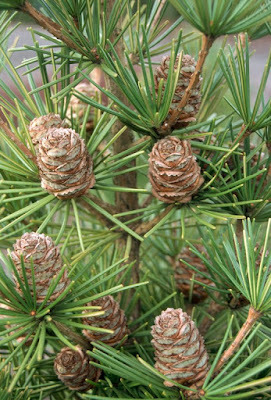 The evergreen is far from my favorite conifer, though we do grow a few cultivars which are grafted onto disease-resistant rootstock. 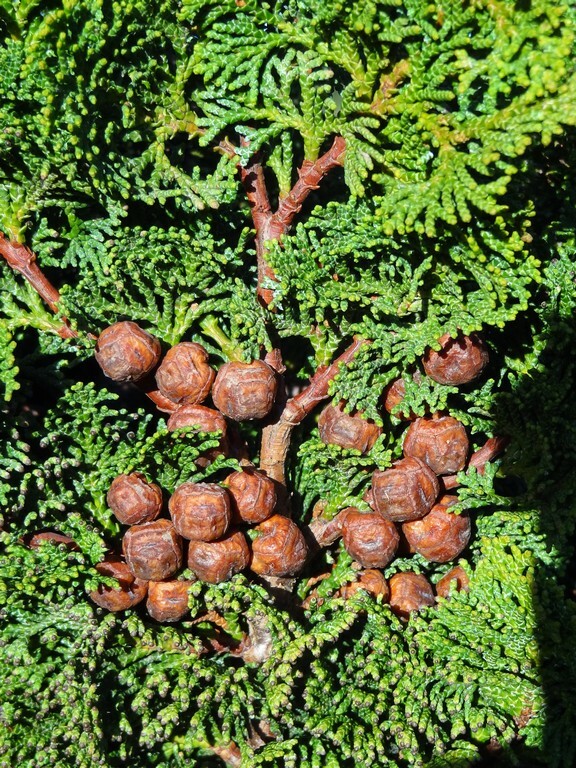 C. lawsoniana is commonly called the “Port Orford cedar” because it is native to the area nearby present-day Cape Blanco, Oregon which George Vancouver originally named for George, Earl of Orford, “a much respected friend.” Today the incorporated city of Port Orford with its 1,000 souls is the westernmost incorporated place in the 48 contiguous states. Charles Lawson (1795-1873) was a Scottish nurseryman and merchant, noted for the introduction of foreign flora into the UK. 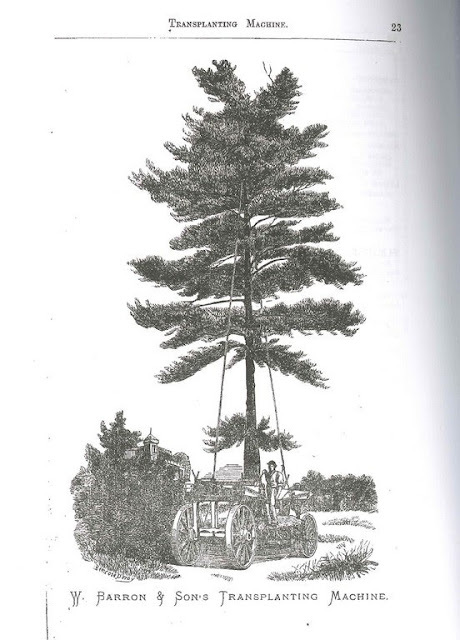 When father Peter (a seed merchant) died in 1821, Charles took over the family business of Peter Lawson and Son and he became a specialist in grass seeds and conifers. 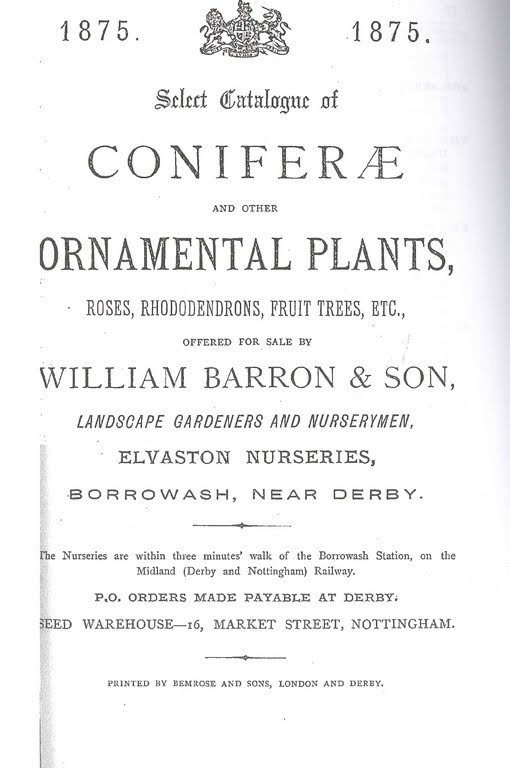 I don't know what ever became of the nursery, except that in 1886 The Lawson Seed and Nursery Co LTD and Liquidators squared off legally versus Peter Lawson and Son Ltd, so I guess they ended up fighting among themselves. 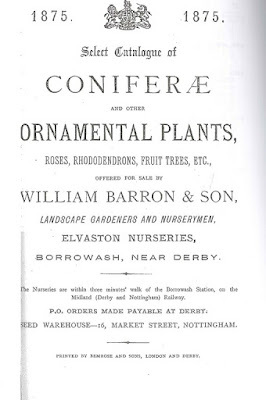 I can accept that some Flora Wonder Blog readers don't give a hoot about old British horticulture, and couldn't care less about nurserymen from 100 years ago. Why does old Buchholz dwell so far in the past? Well, I have books with old photographs of nursery men and women, and everybody appears healthy and earnest and completely engaged in their activities. I'd love to do a year's internship at a British nursery in 1875. Of course it would be better if I was still in my twenties or thirties, but I would gain knowledge and perspective on my chosen craft.